mI work 9-7 pm every week day and get home by 8-9pm, sleep by 10pm and the day starts all over again. Weekends are mad packed with my kid’s enrichment classes and family time. In between toilet breaks at work, late nights and when I’m breastfeeding Nathen, the husband and I had to plan Nathen’s 100 days baby party within 2 weeks. First we had difficulty deciding on a theme for the 100 days baby party. The husband suddenly suggested a Yellow Duck Nautical Theme and so we decided to bulldoze ahead with that. Happy 100 Days Foil Balloons, 39 Latex Balloons & 2 rolls of white ribbons from Taobao here. 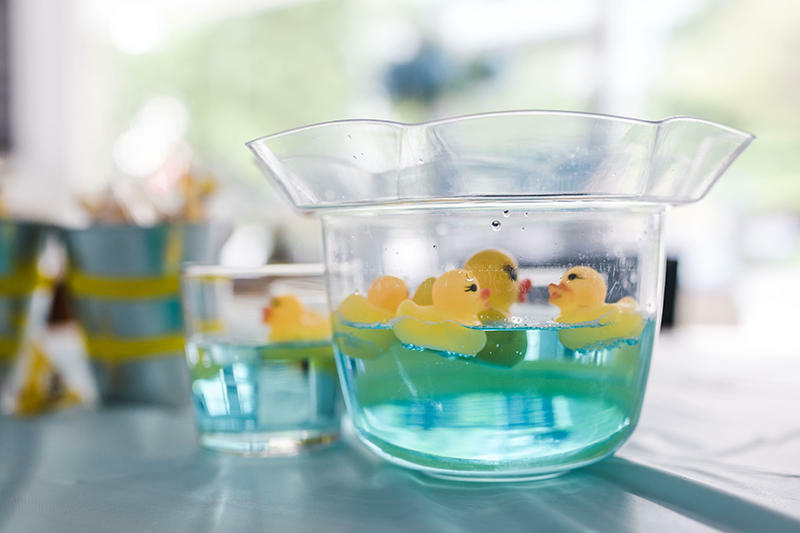 Little Rubber Ducks x 20pcs from Taobao here. 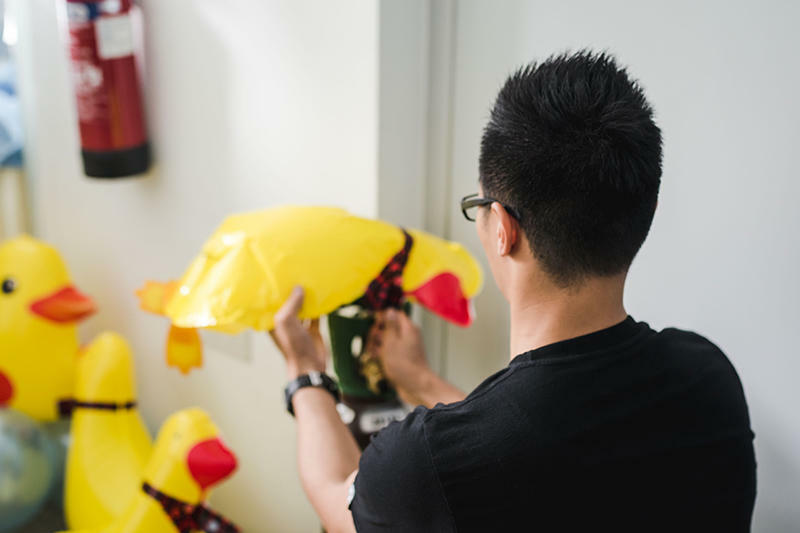 3 X Duck Balloons and 25 X Pet-Walker Duck Balloons from here and here. I checked out SO MANY caterers and nearly went with the usual big names when I chanced upon Manna Pot Catering. I was SUPER excited because they not only provide buffet catering but they also do dessert tables AND event decor. ONE STOP SHOP!!!! I didn’t even think twice and quickly decided to engage them. Previously I thinking of getting a party planner do up the place for me but that didn’t work out and was a little too costly so finding Manna Pot Catering was such a gem. 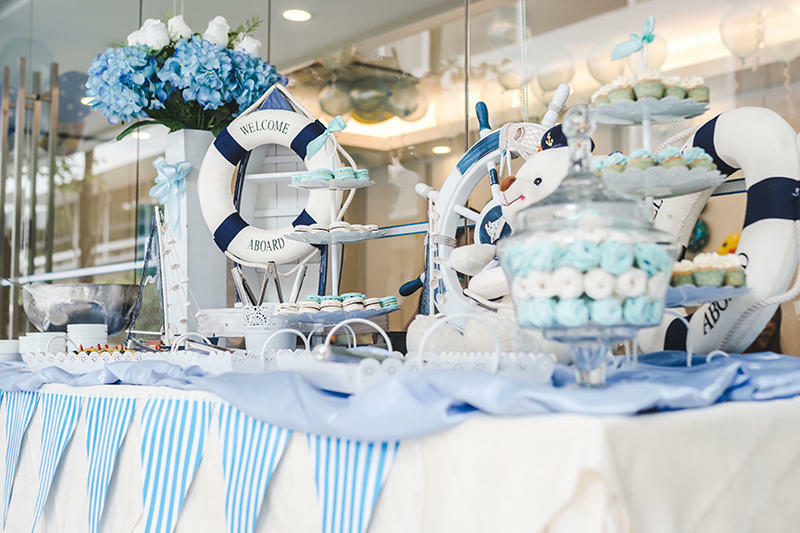 I ordered Great Value Buffet A, a dessert table and added on a blue nautical theme buffet table decor. 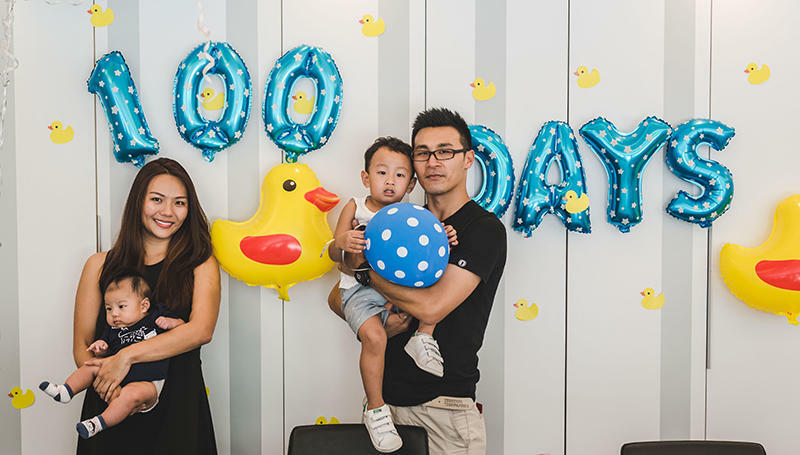 Look at the amazing job they did for my 100 days baby party. 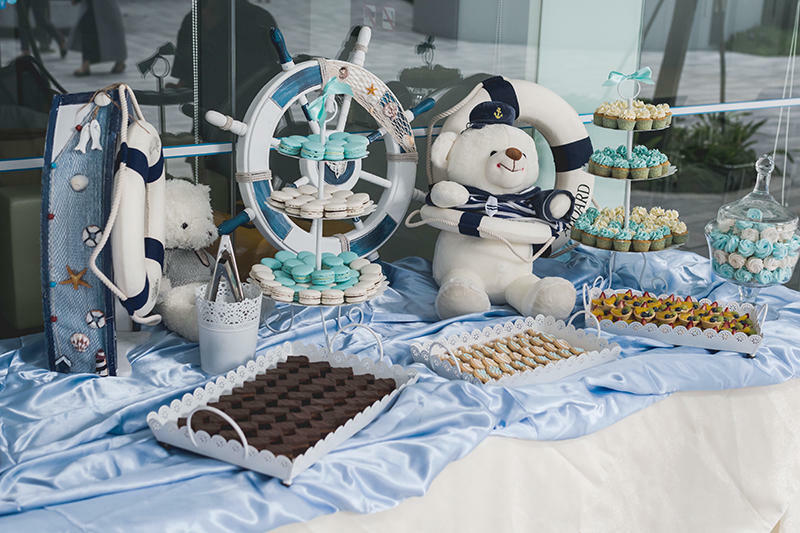 The 100 days baby party event decor was done so prettily that many passerbys came by and asked who’s the caterer! 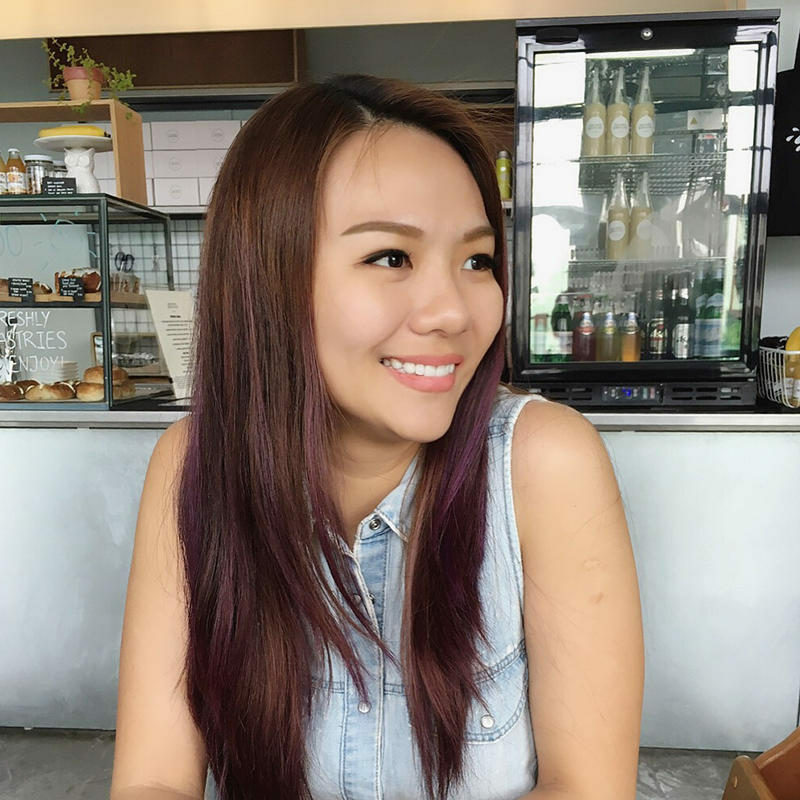 Taste-wise, the food was good, especially the Yang Zhou Fried Rice, Honey-Glazed Mid Wing, Brownies, and Mini Cupcakes – those were completely wiped out! I also want to comment on the delivery guy’s service and attitude – he even gave me tips on how to keep the food. Benson was VERY polite, efficient and friendly. He arrived punctually with 1 other person and setup everything you see in the photos within 30mins. Remember me using babyinlove for Daniel’s full month party? 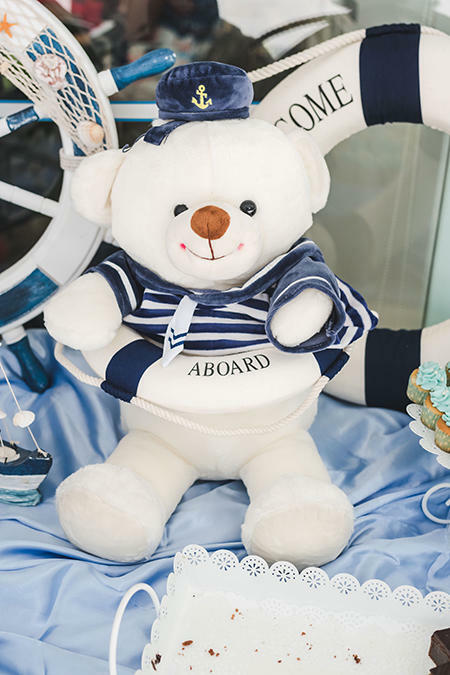 There are my go-to people for modern baby full month party gifts. I wanted an alternative to the usual red eggs, ang ku kueh, swiss cakes and cupcakes and could consume in their own sweet time, and something that would be totally instagrammable. I ordered a set of 2 blue baby cookies and these came in their own pretty boxes and announcement cards. 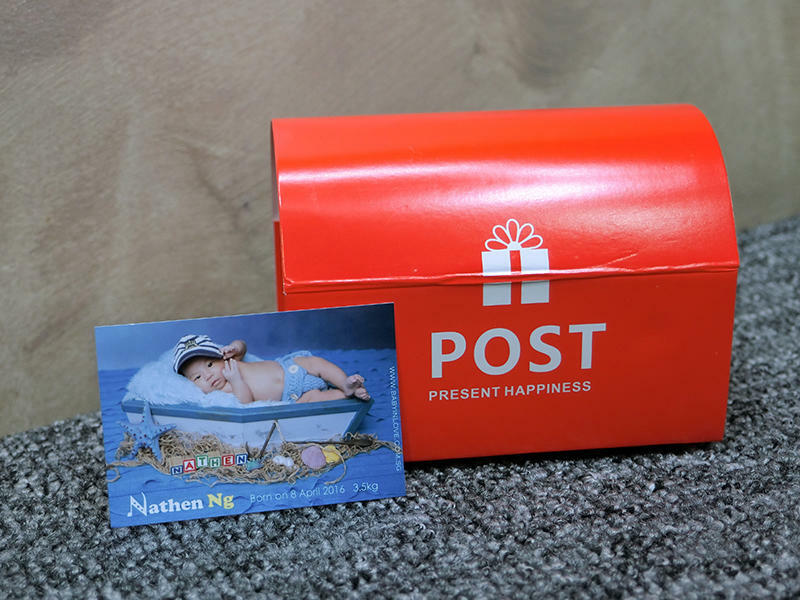 :) I love that the announcement cards can be personalised with my child’s name, photo, DOB and weight at birth. My guests all had a little something of Nathen to bring home. My party was due to start at 11am and the delivery came promptly at 10.30am as promised. 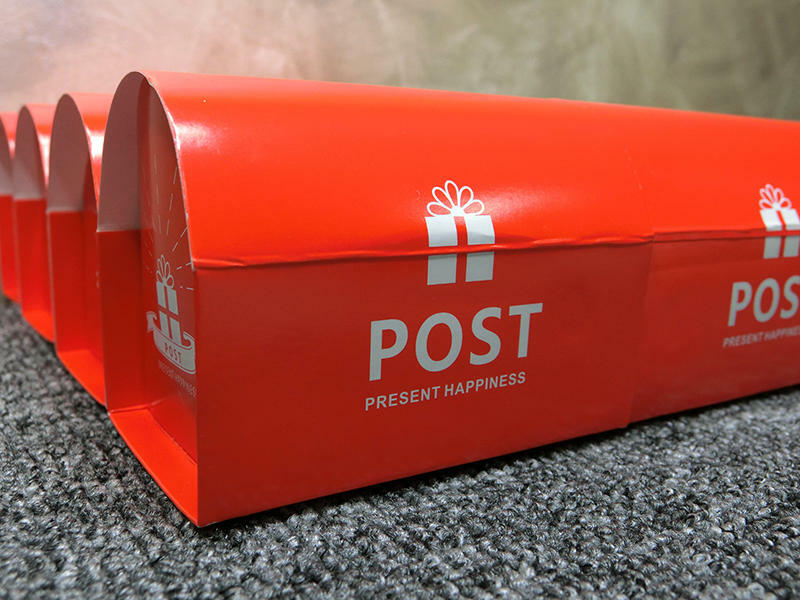 They provided clear plastic bags for all the boxes so that my guests can carry this gift home conveniently – very thoughtful! The biscuits can last for more than 1 month – perfect because it took me awhile before I could bring myself to eat cookies that are so cute! The cookies were all vacuum packed and were fresh when I opened it to eat 2 weeks later. The butter cookies wasn’t too sweet and had a great crunch to it. 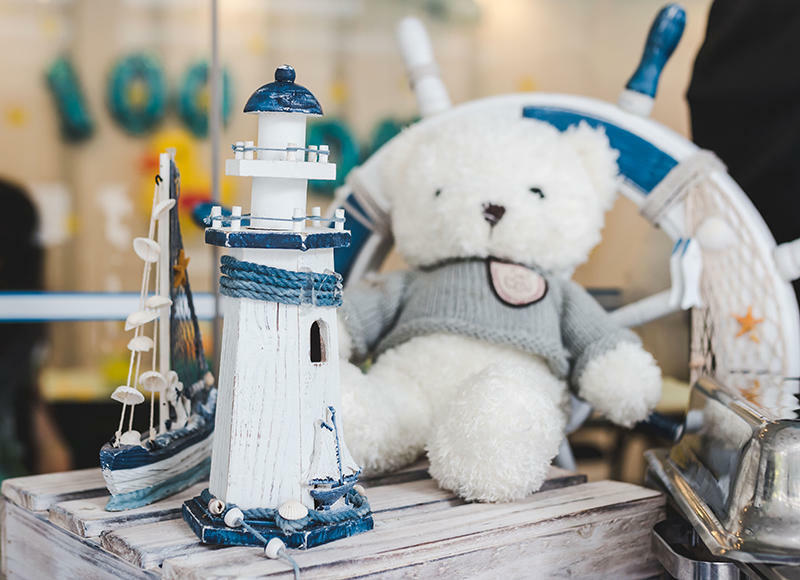 Update: babyinlove has unfortunately closed down permanently. Pet Walker Balloons are DA BOMB. If you have many kids coming to the party, GET THEM. The kids were so captivated with the pet walker balloons and helium balloons that they gave our parent friends time to mingle and eat. Get a Photographer. 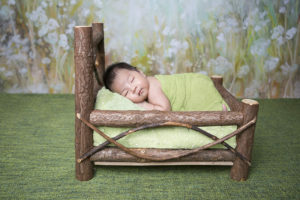 I made the mistake with my first child where I didn’t have any photographer, thinking I could do my own photography. BIG MISTAKE. Where got time to mingle and take photos?! Definitely engage One Stop Shops. I cannot emphasise how crucial this was to the success of my party. One stop shops like Manna Pot Catering save A LOT of time and effort. Engage trusted companies. Check the companies you want to work with for reviews and read more than 1 review to get an idea of how trustworthy they are. You wouldn’t want them screwing up your party!